Credit: Image courtesy of Marcela Rojas-Pierce. A little-studied plant cellular complex plays an essential role in a biological process – vacuole fusion – critical to plant growth and development, according to new research from North Carolina State University. The findings shed light on complex and important plant processes as well as on how plants may have adapted to respond to environmental signals. Vacuoles are critical plant cell units that comprise some 80 to 95 percent of most plant cells. Plants die if vacuoles fail to develop properly. Believed to be a kind of plant garbage dump, with multiple roles in storage and recycling, vacuoles are also critical for pollen development, with sterility the consequence if the process goes awry. While many plant cells contain one large vacuole, Marcela Rojas-Pierce wants to examine how, in some model plant Arabidopsis cells, vacuoles control the opening and closing of stomata – plant "pores" that must be regulated to balance carbon dioxide intake and the release of oxygen via water vapor. "Vacuoles fuse together when stomata open as they are exposed to light, and then they come apart or fragment to close the stomata when it is dark," Rojas-Pierce, associate professor of plant and microbial biology at NC State and the corresponding author of a paper describing the research, said. "But this beautiful and elaborate system must be tightly regulated to properly ensure the plant's response to the environment." Rojas-Pierce and colleagues examined the homotypic fusion and vascular protein sorting, or HOPS, complex of proteins. First identified as important in vacuole fusion in yeast, HOPS works with another group of proteins, the soluble NSF attachment protein receptors, or SNAREs, to promote vacuole fusion. "SNARE proteins actually do the job of vacuole fusion, but our study showed that the HOPS protein VPS41 may be a key player in the process, while HOPS protein VPS33 may act as a chaperone to guide vacuole fusion," Rojas-Pierce said. She added that this system is similar in other eukaryotes, or organisms with a cell nucleus. The study also revealed some surprising findings. In yeast, the presence of certain lipids is required for vacuolar fusion to take place. This and a previous study found, instead, that these regulatory lipids inhibited vacuole fusion in plants. The current study also showed that the curvature of the vacuolar membranes may play an important role in their fusion in plants. "This study showed both highly conserved and specific mechanisms for HOPS and its role in vacuolar fusion," Rojas-Pierce said. Paper co-authors included Carla Brillada, Jiameng Zheng and Eliezer Rovira-Diaz from NC State, and Falco Kruger, Jana Christin Askani and Karin Schumacher from Heidelberg University. "Phosphoinositides control the localization of HOPS subunit VPS41, which together with VPS33 mediates vacuole fusion in plants"
Abstract: The vacuole is an essential organelle in plant cells, and its dynamic nature is important for plant growth and development. Homotypic membrane fusion is required for vacuole biogenesis, pollen germination, stomata opening, and gravity perception. Known components of the vacuole fusion machinery in eukaryotes include SNARE proteins, Rab GTPases, phosphoinositides, and the homotypic fusion and vacuolar protein sorting (HOPS) tethering complex. HOPS function is not well characterized in plants, but roles in embryogenesis and pollen tube elongation have been reported. Here, we show that Arabidopsis HOPS subunits VPS33 and VPS41 accumulate in late endosomes and that VPS41, but not VPS33, accumulates in the tonoplast via a wortmannin-sensitive process. VPS41 and VPS33 proteins bind to liposomes, but this binding is inhibited by phosphatidylinosiltol-3-phosphate [PtdIns(3)P] and PtdIns(3,5)P2, which implicates a nonconserved mechanism for HOPS recruitment in plants. Inducible knockdown of VPS41 resulted in dramatic vacuole fragmentation phenotypes and demonstrated a critical role for HOPS in vacuole fusion. Furthermore, we provide evidence for genetic interactions between VPS41 and VTI11 SNARE that regulate vacuole fusion, and the requirement of a functional SNARE complex for normal VPS41 and VPS33 localization. Finally, we provide evidence to support VPS33 and SYP22 at the initial stage for HOPS-SNARE interactions, which is similar to other eukaryotes. 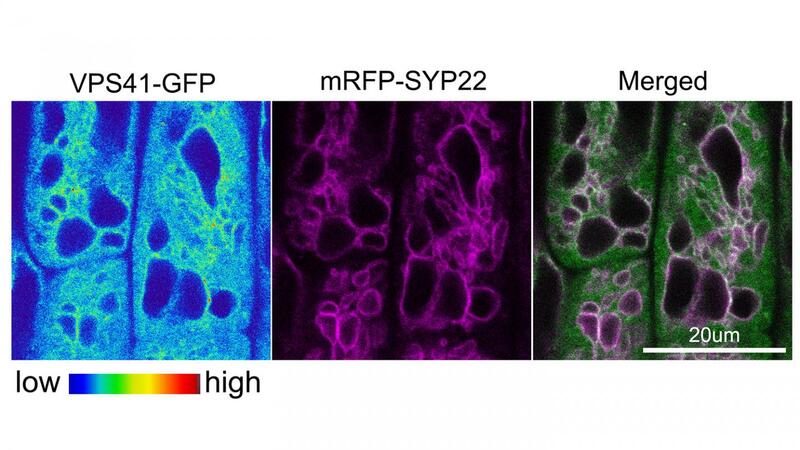 These results highlight both conserved and specific mechanisms for HOPS recruitment and function during vacuole fusion in plants.